Stella Bland Tooson was born on May 27, 1925 in Cincinnati, OH to James Walter and Ladybird Bland. She received her call to join the angels in Glory on January 18, 2019. 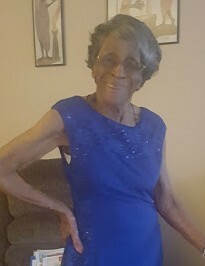 Stella was preceded on the Glory train by her parents James and Ladybird Bland, her two brothers Aaron and Noah (Uncle Bone) Bland, her husband Otis Tooson, Sr., granddaughter Amber Robinson, infant grandson Greg, and two great-great-grandchildren as infants. Stella was united in holy matrimony to Otis C. Tooson, Sr. on January 16, 1942. On January 16, 2014 they celebrated their 72nd wedding anniversary. After seventy two years of marriage, it is difficult to speak of Stella without mentioning Otis. Together, Otis and Stella purchased a home in Lincoln Heights, Ohio where they raised their five children. They resided in their home for sixty eight years. After working for Children’s Hospital and Tyler’s Restaurant, Stella became a stay-at-home mom and homemaker. She stayed busy as she would volunteer for PTA at Lincoln Heights Elementary and the Democratic Party. Otis & Stella have always actively supported each of their children, grandchildren and great grandchildren. If they were invited and had a way, they would gladly come to any of our events. Otis and Stella, although not perfect, displayed the perfect example of love, commitment and dedication. Their legacy for generations to come is their belief in God and Jesus as our Lord and Savior and family bond goes deeper than issues. The Tooson and Bland family traditions are a part of our life’s journey it is what we do. Yearly family reunions, Christmas Eve birthday celebration and First Sunday of the New Year family fellowship at Bethel AME Church. Stella leaves to cherish her memory and build on her legacy: their loving children Otis W. Tooson, Jr. (Pat), Russell Tooson, Sr. (Penny), Lester Tooson (Pearl), Marshall Toosn, Sr. (Hadassah) and Debra Tooson-Hamilton (Gregory); 23 grandchildren, 81 great-grandchildren and 39 great-great-grandchildren and a host of other family and friends. To God be the glory; Stella you have done well.